There have seen a few tracked wheelchairs that were capable of tackling uneven terrains and steep areas. However, wheels are the obvious choice when you talk of regular surfaces. Whereas, tracked wheelchairs work best for steep terrain. 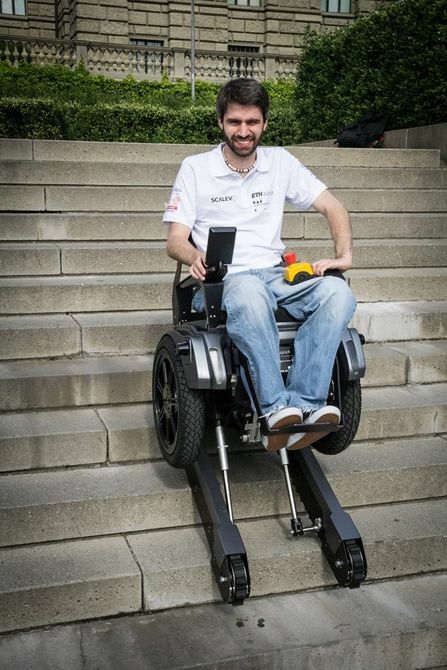 For a user in wheelchair, changing between tracked and regular wheelchair isn’t feasible for obvious reasons and therefore, a group of students from ETH Zurich and the Zurich University of the Arts are developing Scalevo electric wheelchair. This wheelchair has wheels for cruising around and tracks for when you need to climb stairs. When it is on a smooth surface, it makes use of its two wheels for balancing itself in a Segway like manner. This allows it to remain agile and thus be able to make sharp turns. Once it reaches a flight of stairs, the twin rubber tracks are employed. They are lowered from the undercarriage and are used for carrying the wheelchair over. A group of pistons, relative to the tracks, tilt the chair back, thus keeping the user leveled. The group comprises of electrical and mechanical engineering students who have a working prototype available now and have plans for using it next year in the Cybathlon. Cybathlon is an ETH sponsored race for athletes who are disabled and use assist devices. The team is currently working on improving its speed so that it is capable of climbing one step per second.